Saw this originally on http://www.villagevoice.com/, but http://www.onlytheblogknowsbrooklyn.typepad.com/ had the reaaaal lowdown. Got junk? Want new Junk? Saturday's your day...read on. 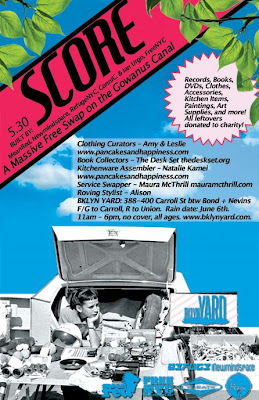 On Saturday, May 30th, the Gowanus Canal will lend its shoreline to Brooklyn's biggest free store. MeanRed Productions is teaming up with FreeNYC, Newmindspace and RefugeNYC (the same folks who brought you the Wall Street Pillow Fight) to transform the waterfront venue, BKLYN Yard, into an open-air free boutique. Hundreds of records, clothes, household items, and regretful "impulse buys" will find new homes. This one-day event celebrates the joys of finding treasure in some one else’s trash. 1. Attendees bring their old Twisted Sister albums, ill-advised sample sale purchases, well-intentioned holiday gifts, etc...and leave with new treasures!